A fresh analysis of the data put out by the National Family Health Survey 2015-16 has found that Gujarat, the state considered model by Prime Minister Narendra Modi for others to follow, has one of the lowest percentage of children in the age group 6-23 months “getting adequate diet”. 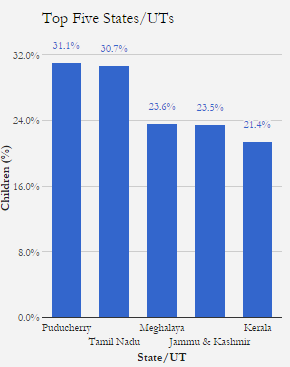 With just 5.2% children found to be in this category in Gujarat, even “Bimaru” Uttar Pradesh has a higher percentage of children getting adequate diet – 5.3%. 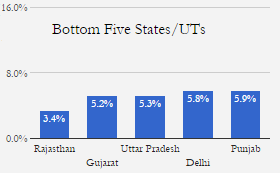 The only state which performs worse than Gujarat is the neighbouring Rajasthan, 3.4%, the analysis, carried out by a University of Sussex, has found. The states which perform best in this respect include Puducherry (31%), followed by Tamil Nadu (30.7%), Meghalaya (23.6%), Jammu & Kashmir (23.5%), and Kerala (21.4%). If after birth, during 0-6 months, breast milk alone is considered sufficient to meet an infant’s requirement for food and water, the period of transition from exclusive breastfeeding to family foods, referred to as complementary feeding, covers a child from 6-23 months. “Optimal breastfeeding in the first year and complementary feeding practices together can prevent almost one-fifth of deaths in children under five years of age, according to the United Nations Children’s Fund”, Saha adds. “Optimal complementary feeding is the most effective intervention that can significantly reduce stunting during the first two years of life. Stunted children are more susceptible to fall sick, underperform in schools, more likely to become overweight and often earn less than non-stunted co-workers”, Saha continues. The guidelines for adequate diet, as per the World Health Organization (WHO), include continue frequent, on-demand breastfeeding until two years of age or beyond; start feeding at six months with small amounts of food and increase gradually as the child gets older; increase the number of times that the child is fed: 2–3 meals per day for infants 6-8 months of age and 3-4 meals per day for infants 9-23 months of age, with 1-2 additional snacks as required; use fortified complementary foods or vitamin-mineral supplements as needed; and so on.